Meditation - How Does it Work, and What Can Meditation for Stress Management Do For You? 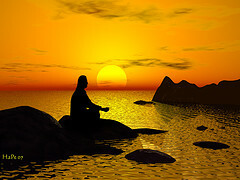 Meditation, the Sanskrit name being Dhyana, is a stilling of the chatter of the mind and is recognized as a major component of Eastern religions, where it has been practiced for possibly well over 6,000 years. It is not a difficult practice, but does take some basic instruction, which will help in smoothing out the process. It is not something that you must force upon yourself. The key words are - Easy, Gentle, Non-judgmental. Once you experience the inner joy it produces, you will want to enter into that blissful place often. It is very helpful to establish a routine to your practice, so setting aside a certain time every day will be very beneficial. The best times to meditate are early morning and just before dinner. Of course, any time you can devote to it is fine. Practicing is only difficult if we become too concerned and worried about doing it correctly. Although staying focused does become easier with time and practice, it is important to keep in mind that there is no right or wrong way to do it. Just let the process happen. Simply following some very basic guidelines will help you to get tremendous benefits from your practice. If you have your own special information or story on your meditative practice, click here to jump down to the Forum. Your practice will be best carried out in quiet, peaceful and serene settings, free from distractions. The whole aim is to relax and diminish anxiety. It is therefore a must to be away from the hustle and bustle around you. This is a practice that helps bring balance to your mind, body, and spirit. The benefits are infinite once you develop the foundation. In a world of daily stress and anxiety, it is the bridge to focused awareness. As a form of alternative medicine, it brings about mental calmness and physical relaxation. It works to suspend the stream of thoughts that constantly occupy the mind. The many benefits are numerous and scientifically validated. Practitioners experience higher energy levels, better concentration throughout daily tasks, and reduced stress levels. It is one of the best stress reducers and is now used by hospitals and physicians for that purpose, with many health care facilities providing classes for patients. The benefits are well substantiated by modern science. Over six hundred academic and scientific studies have been done at more than two hundred independent research institutions in thirty-five countries. Some of the many physical benefits include stress reduction and reduced anxiety, which helps to maintain a state of harmony with your surroundings, better concentration, slower heart rate, normalized blood pressure, lowering of cholesterol, increased serotonin levels and a slowing down of the rate at which the body ages. The most profound benefit, however, comes from the unity consciousness that starts to unfold in our awareness. We begin to feel a heightened sense of Presence, and a connection to something much higher than our limited sense of self begins to occur. In the Eight Limbs of Yoga of Patanjali's Sutras, the last four limbs, Pratyahara, Dharana, Dhyana and Samadhi, are all part of the process. The last stage, Samadhi, means a state of bliss or super consciousness, wherein the meditator becomes one with the object being meditated upon, the Universal Spirit. In his book, Light on Yoga, B.K.S. Iyengar states, "As water takes the shape of its container, the mind when it contemplates an object is transformed into the shape of that object. The mind which thinks of the all-pervading divinity which it worships, is ultimately through long-continued devotion transformed into the likeness of that divinity." I find that filling a room with the wonderful scent of essential oils is very conducive to the meditation process. Visit Envy My Health.com for great information and a free download on aromatherapy. Read on for more information on different techniques. What is your Advice for the best Meditation Experience? Have you had an exceptional experience through the practice of meditation? Do you have advice or recommendations that you would like to give? The attainment of Samadhi is the ultimate experience in meditation. We would love to hear about how it feels when you have reached a "high" in your meditation practice or any other interesting information. Feel free to ask questions. You'll get helpful answers. Don't forget to add a photo of yourself or your favorite place to meditate. This is your space! What is the best form for me?